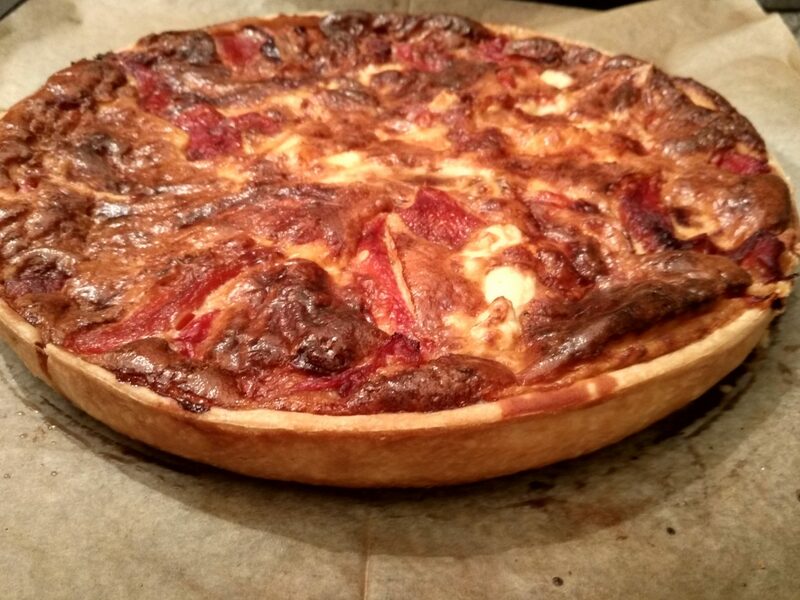 A savory Tarte to be remembered! 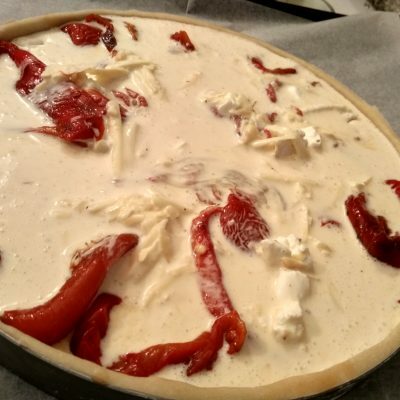 The combination between roasted peppers with goat cheese is brilliant, the spicy deep flavors of the goat cheese along with the smoky Bell peppers creates an amazing combination, so this roasted peppers goat cheese tart is indeed a winner. 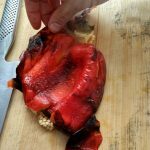 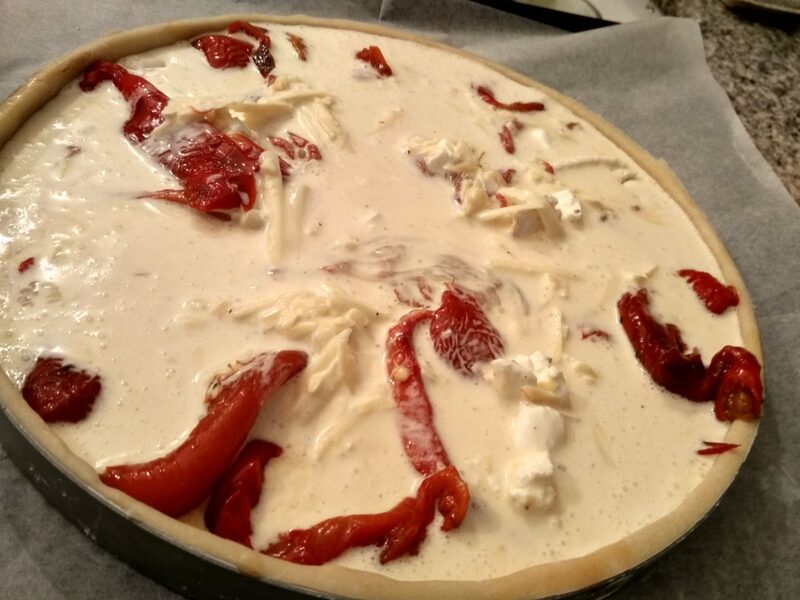 making the roasted pepper goat cheese tart takes some time and effort but the result will create a tart that with strong flavors that is definitely worth it. 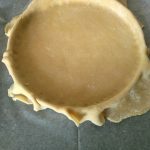 a good tart is first measured by the dough, it needs to be light and crispy, should support the tart filling but shouldn’t be thick and take the focus out of the filling. 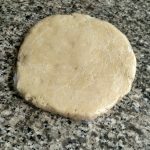 There are a few tart doughs main key point that needs to be kept in order for the dough to succeed. 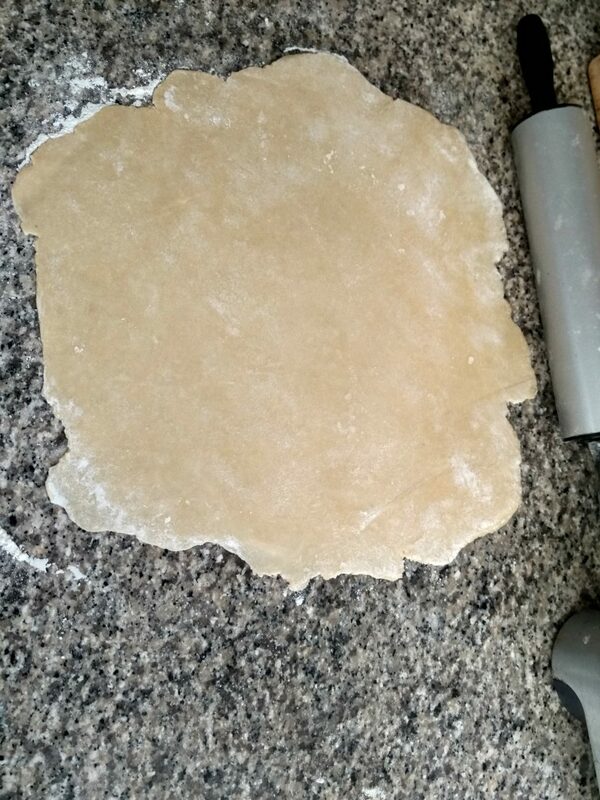 Sift the flour, it helps evenly distribution of all ingredients. 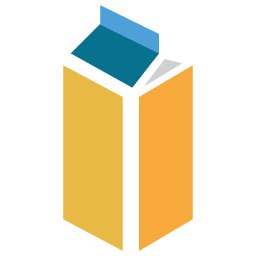 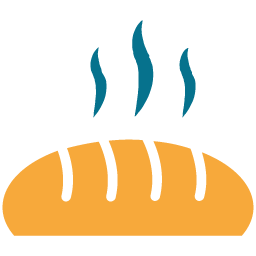 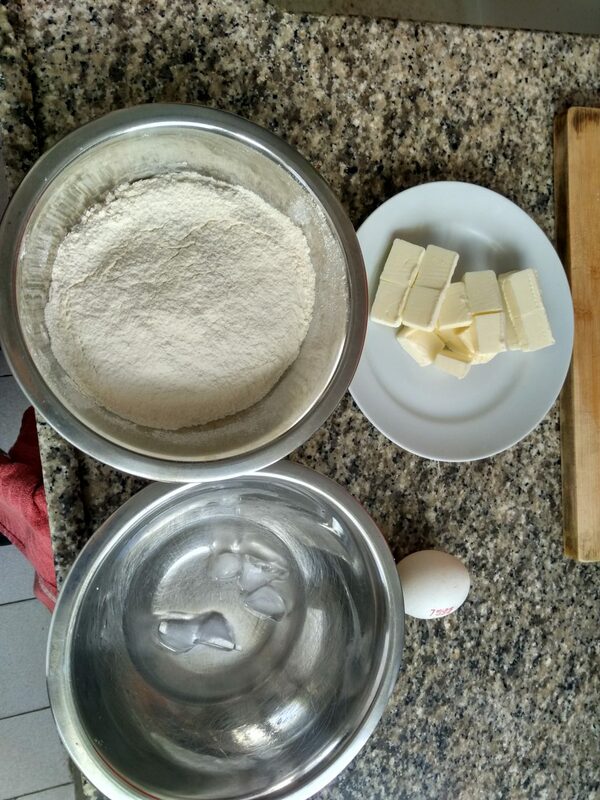 In summer time, all dough materials are kept in the fridge just until used; eggs, flour, water (we use ice water). 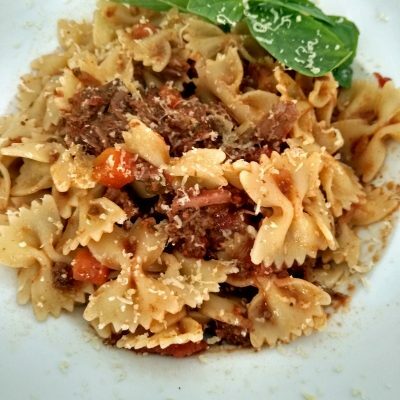 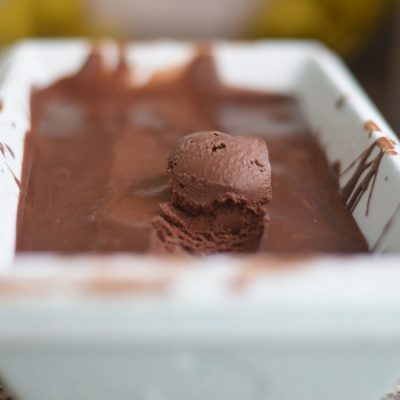 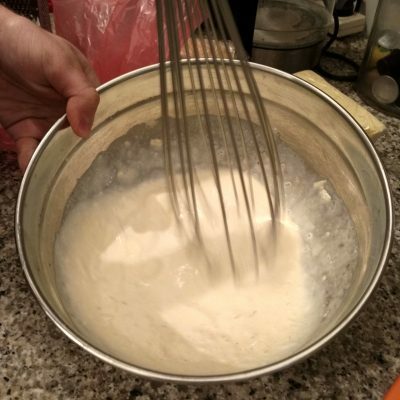 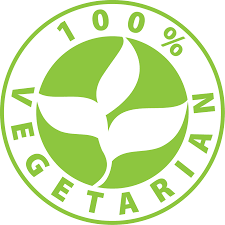 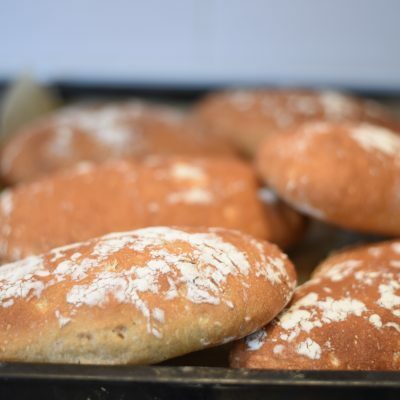 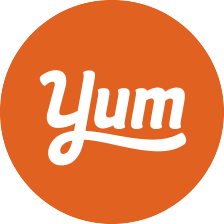 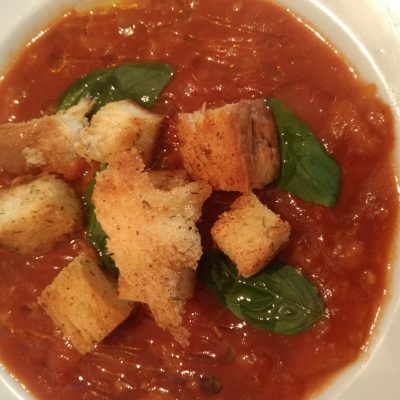 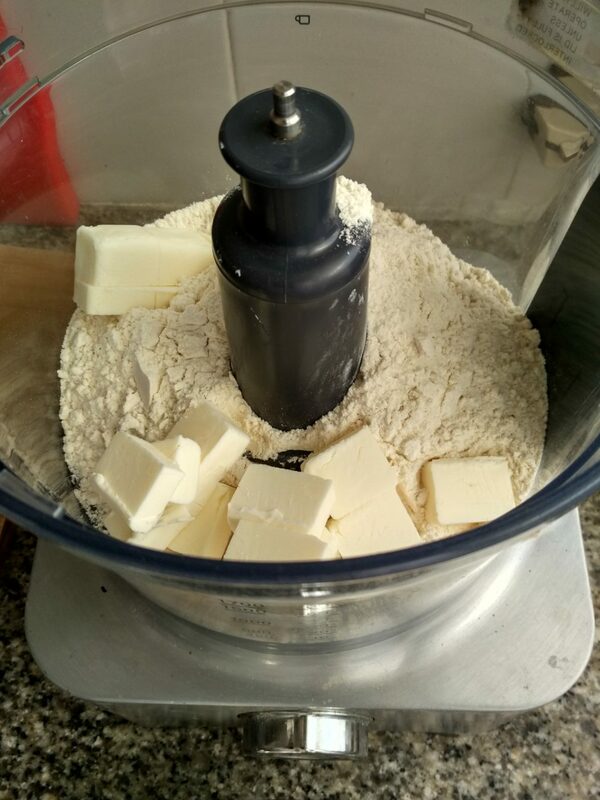 I found that dough is best made in a food processor in short pulses, do not overwork the dough, we are not looking to extract the gluten (elastic dough), just the opposite, we want the dough to be crispy. 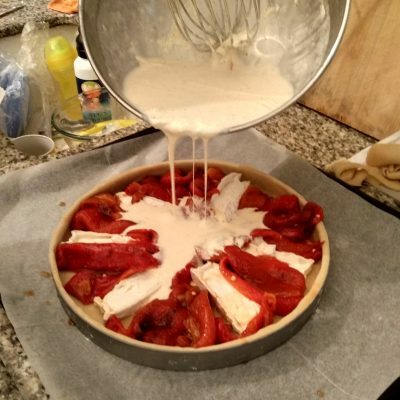 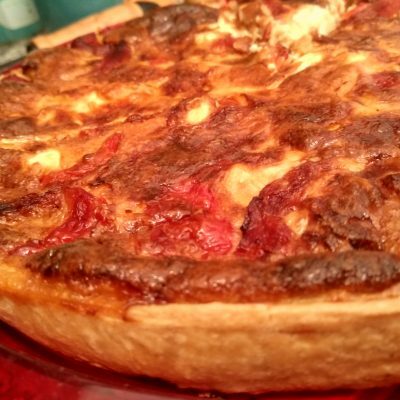 The method is simple, we layer the goat cheese on the bottom of the tart, spread over it the roasted peppers and add the “royal cream” which is a combination of eggs heavy cream, salt pepper and nutmeg. 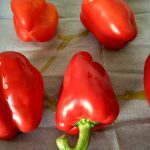 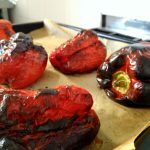 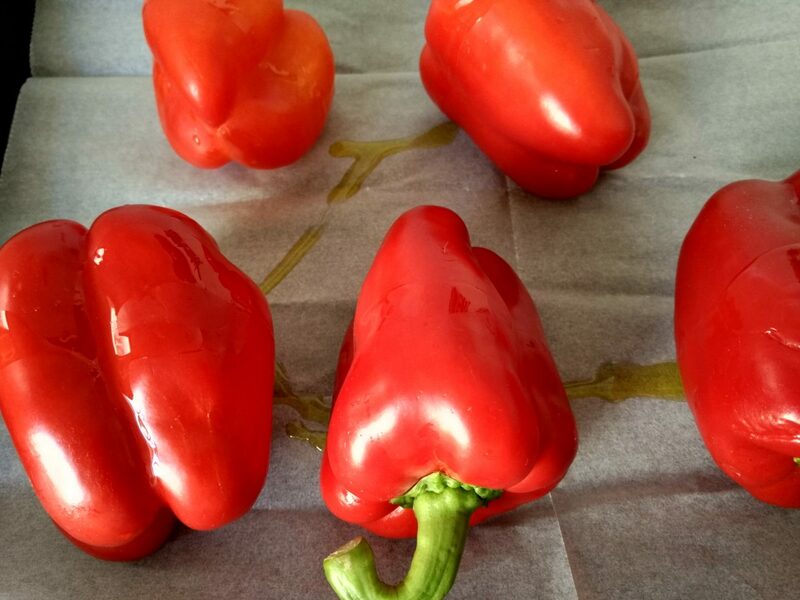 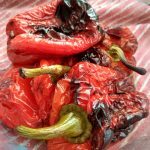 The flavor of the peppers is extremely important, in order to achieve maximum taste from them we need to roast them in the oven on highest temperature up until they are close to burnt (don’t worry about burnt skin, we will soon take it off). 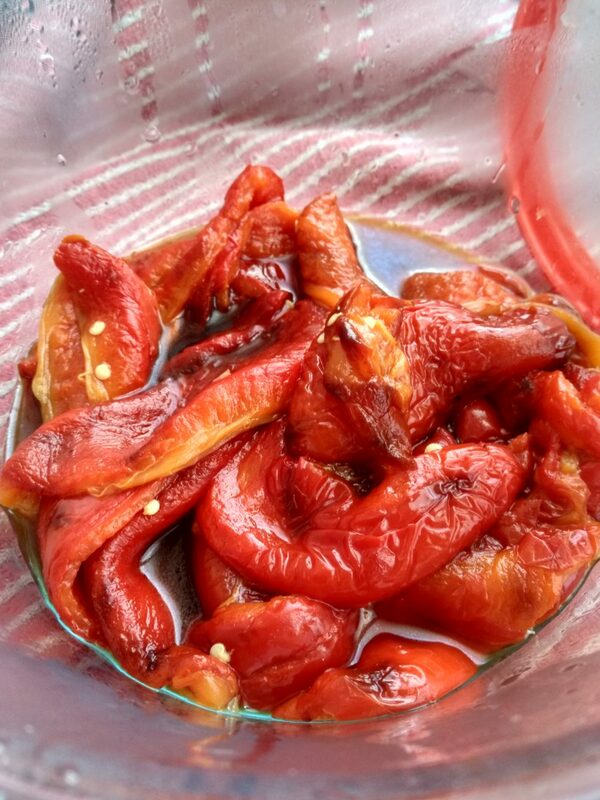 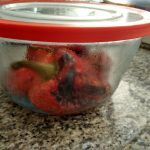 In order to get the skin off easily, place the peppers in a sealed bag or sealed container right after they are out of the oven, this will make them sweat up hence the skin will come off easily. 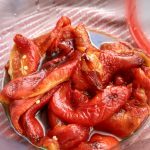 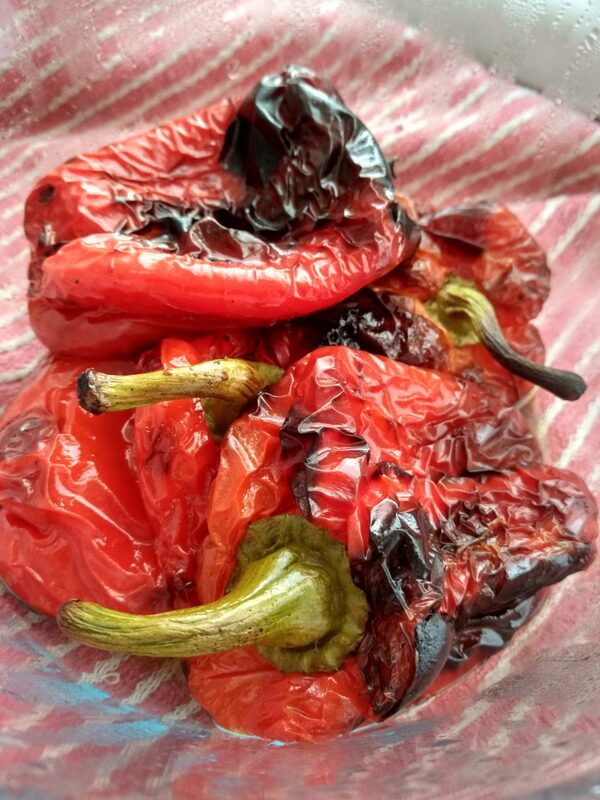 When cleaning, the peppers do not use water under any circumstance, water will wash out flavor as well, clean it by hand, I’d rather have a seed or two in the tart and to keep all the flavors. 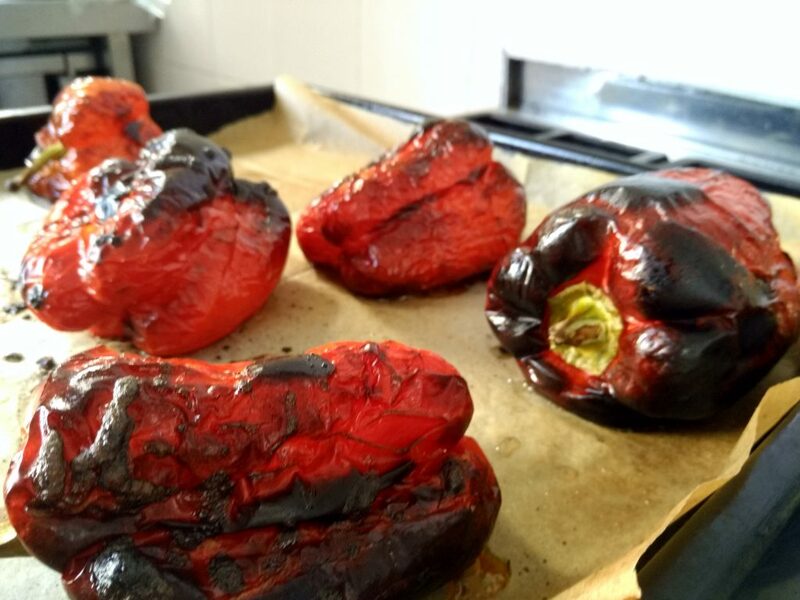 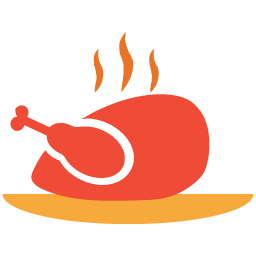 preheat the oven to 225°c/475°F. 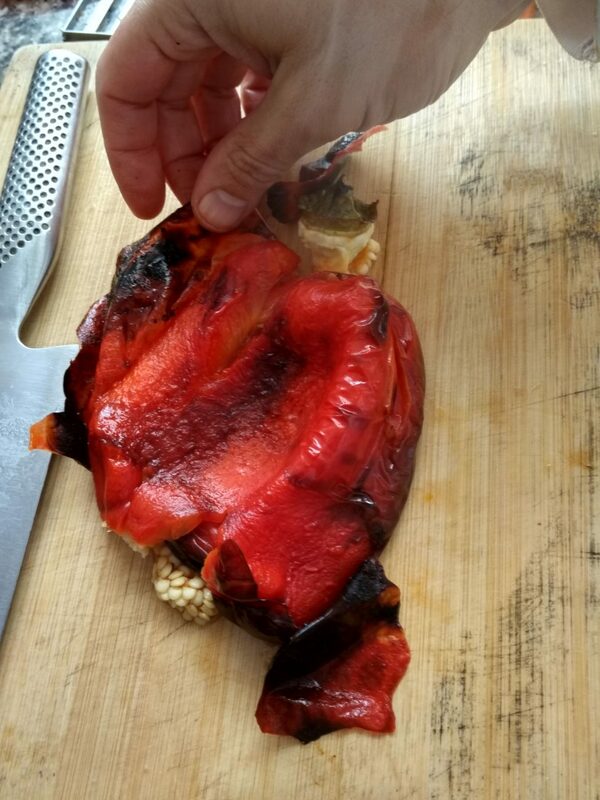 roast for about 45 minutes, flip the peppers on the other side in the middle so they will be grilled evenly. 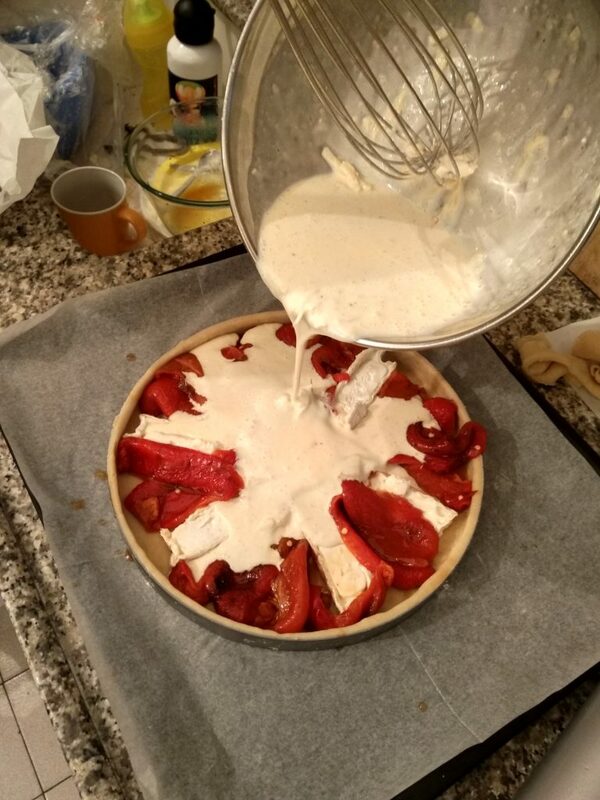 Don't discard the pepper fluids, we will add them later on for the Royal cream. 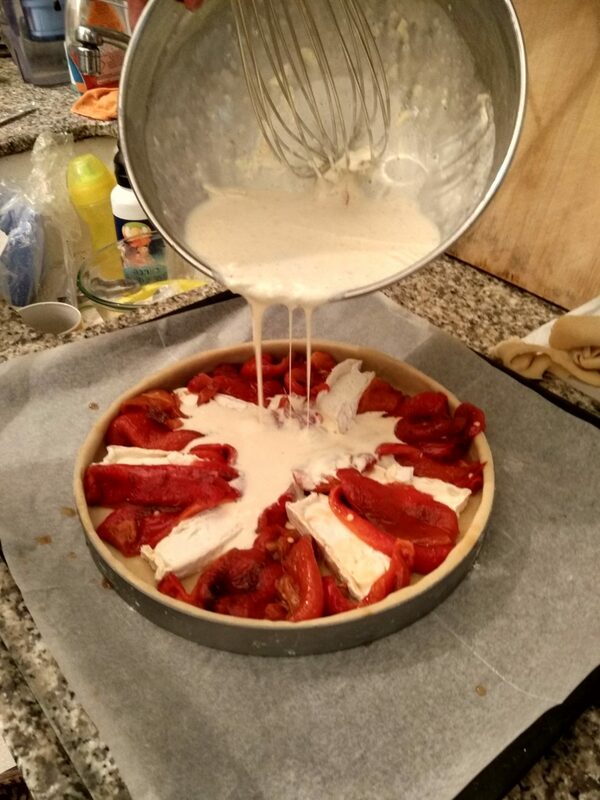 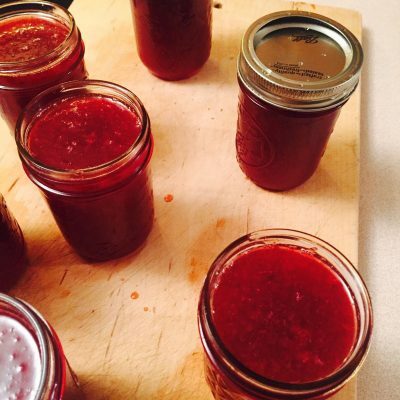 immediately after out of the oven put in a sealed container (yes, whole hot) and let the sweat for 30 minutes. 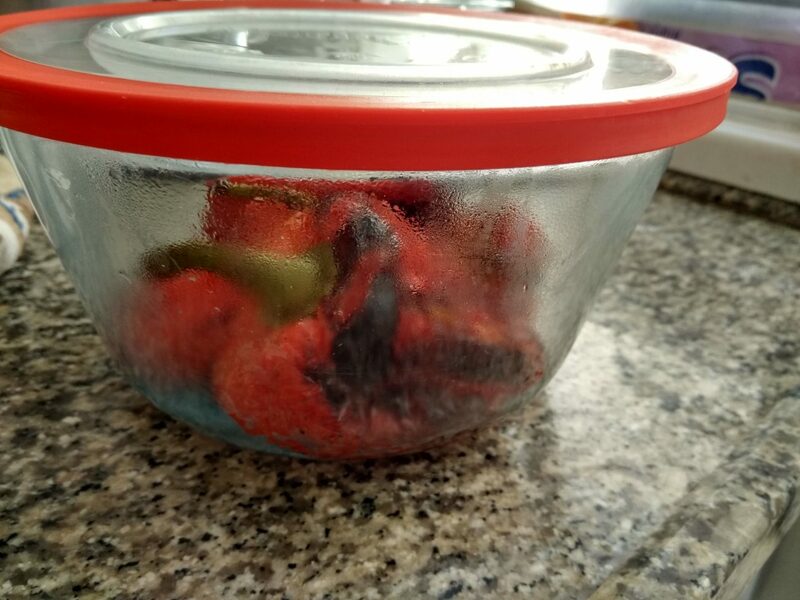 take out of the container, peel and clean the seeds and put back in the container. 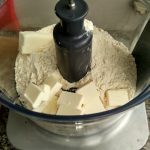 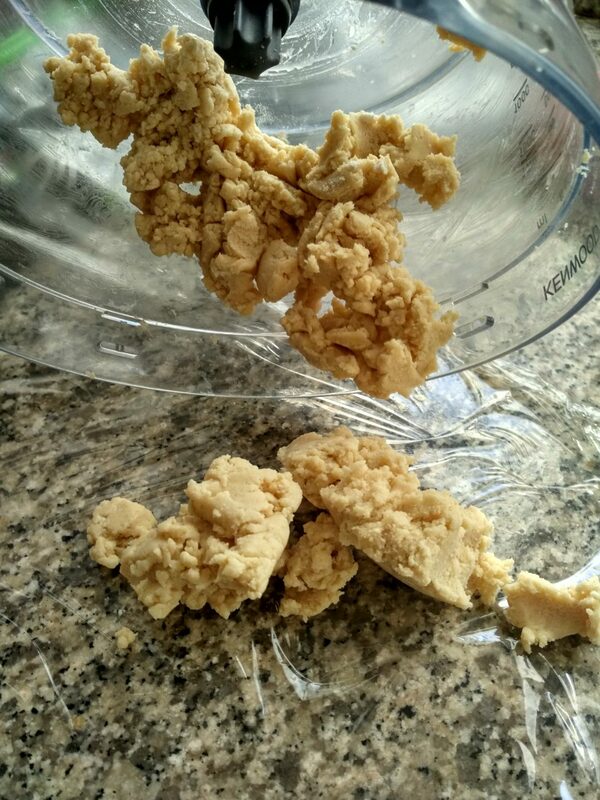 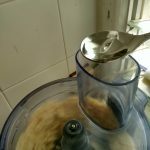 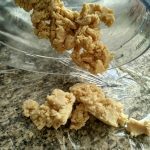 In a bowl of a food processor, sift the flour, salt and the frozen butter. 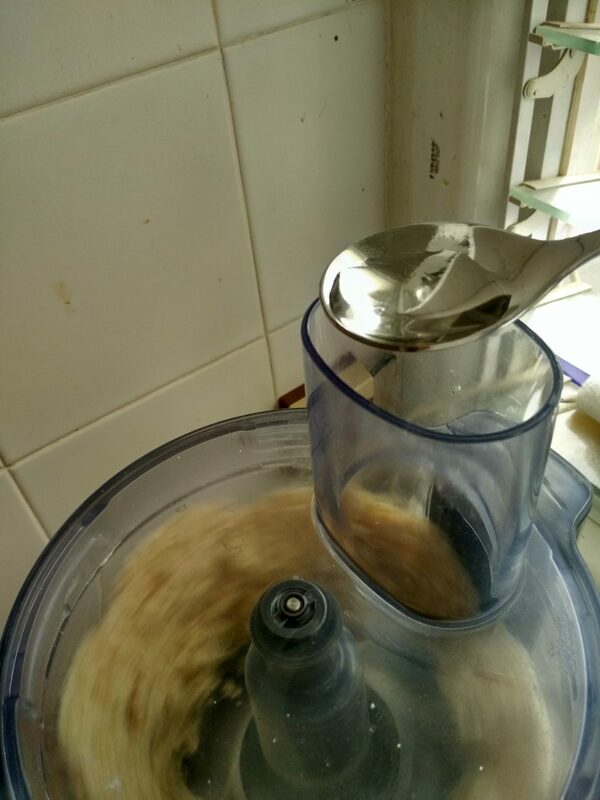 mix on pulses just until mixture is getting grainy. 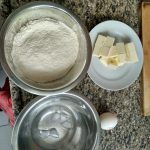 add the egg and mix for 10 more seconds, slow drizzle up to 3 spoons of water just until the dough is forming small bowls. 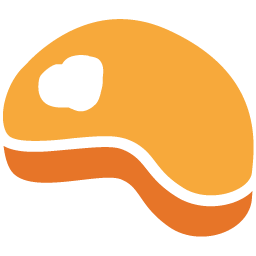 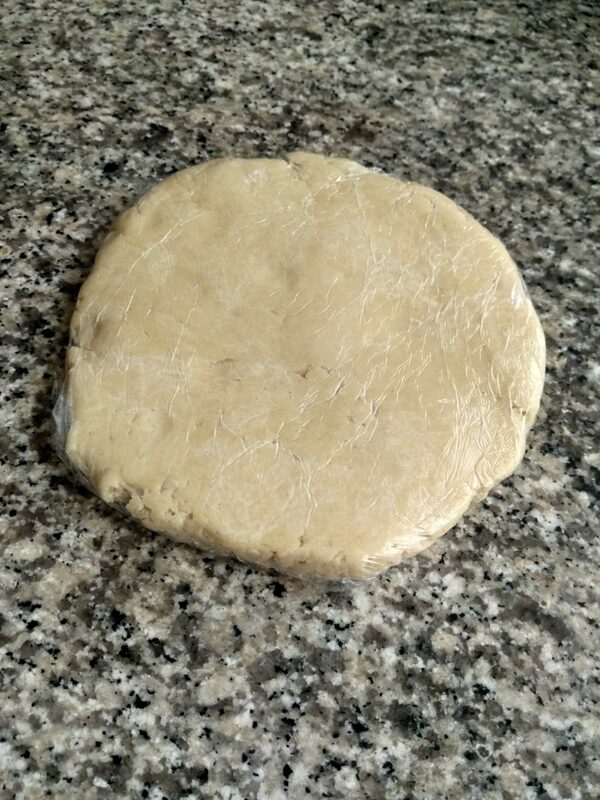 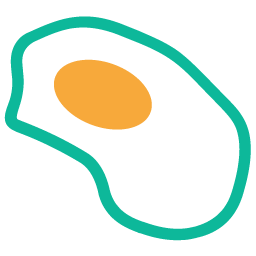 Gather the dough on a work surface and flatten into a disk shape. 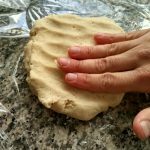 Cover with a plastic wrap and cool for a minimum of 2 hours. 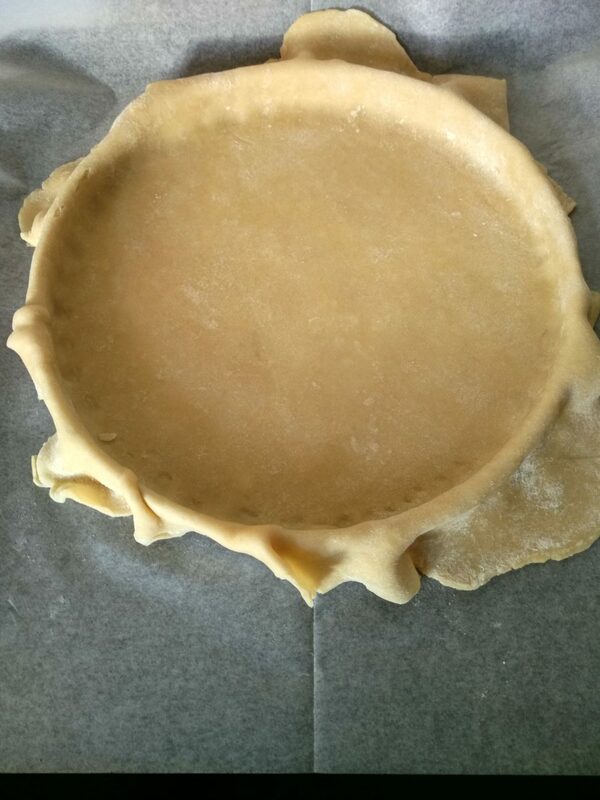 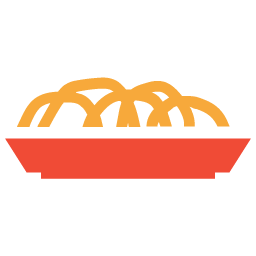 Butter a 26cm round pie pan or spring (10 inch). 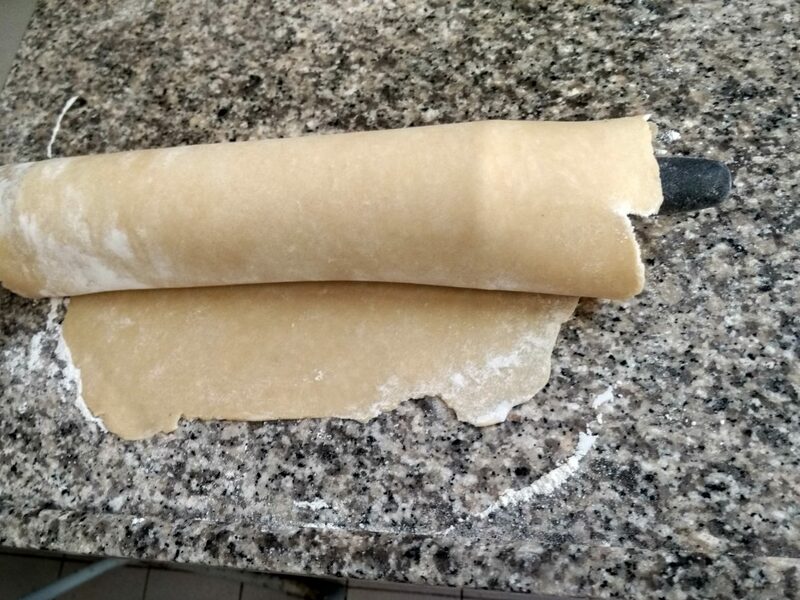 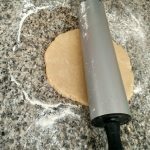 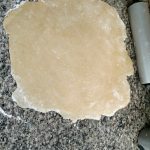 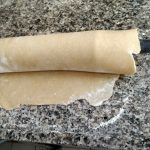 Take the dough out of the freezer and flatten it with the rolling pin to cover the pan in size, use a bit of flour if necessary for it not to stick. 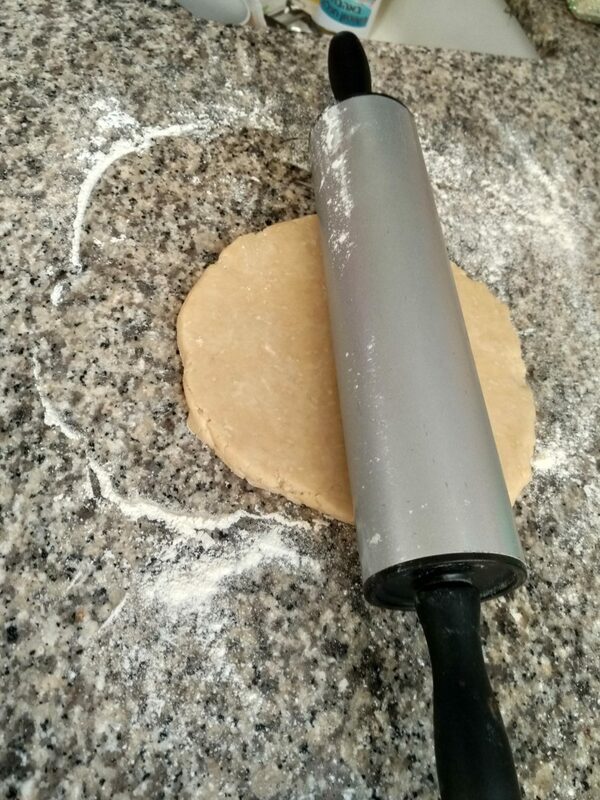 Roll the dough on the rolling pin and place on the baking pan. 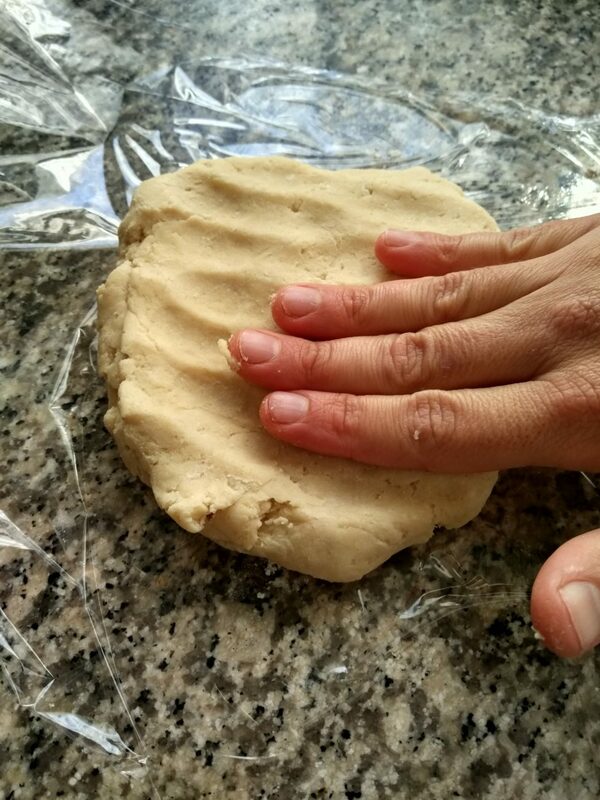 Tighten the dough on the sides of the pan and remove excess dough. 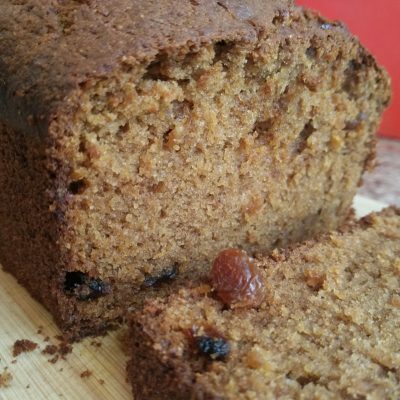 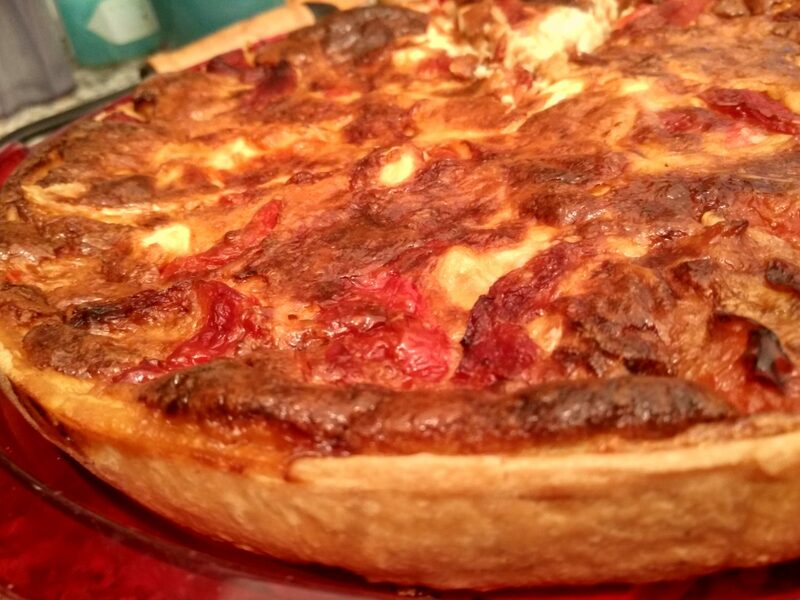 Place in the fridge for another hour (or 20 minutes in the freezer if in a hurry). 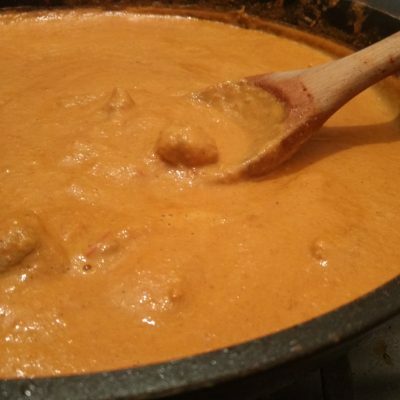 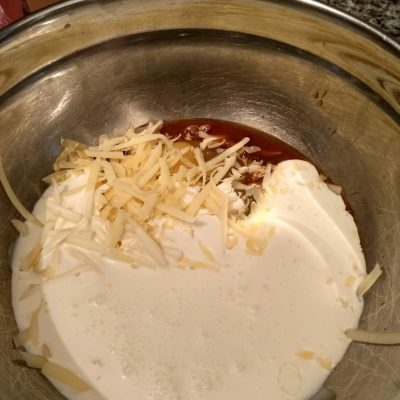 In a bowl, combine, heavy cream, eggs, nutmeg, salt, Pepper fluids and gouda cheese. 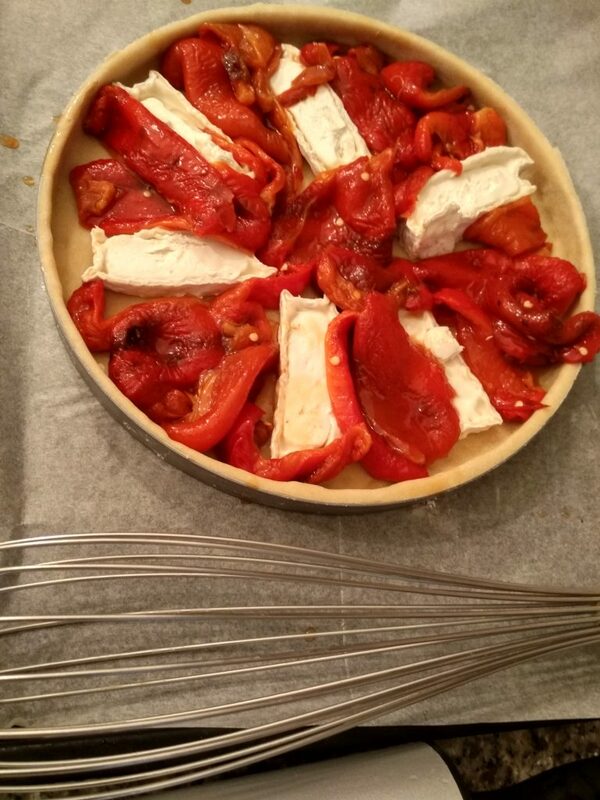 Distribute the goat cheese and the red bell peppers on the tart dough. 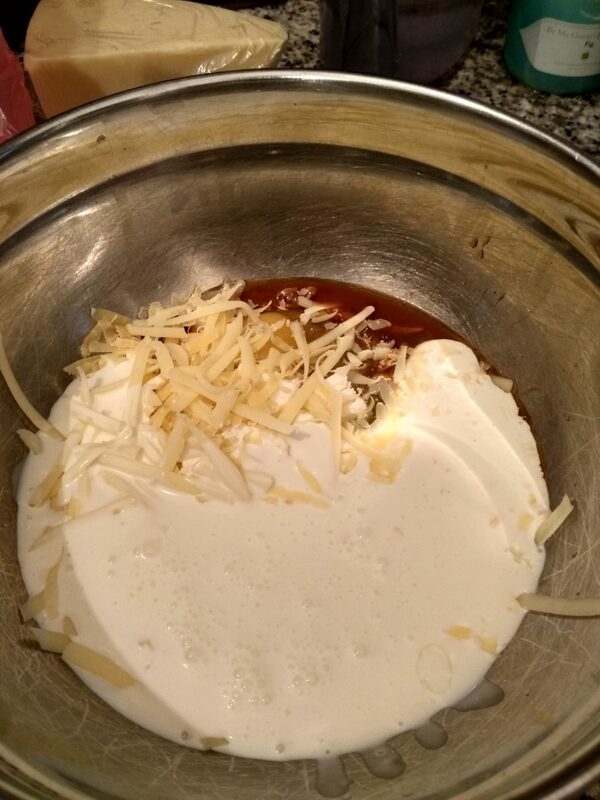 Pour the royal cream on top and bake on 2nd from the bottom shelf for 45-50 minutes. 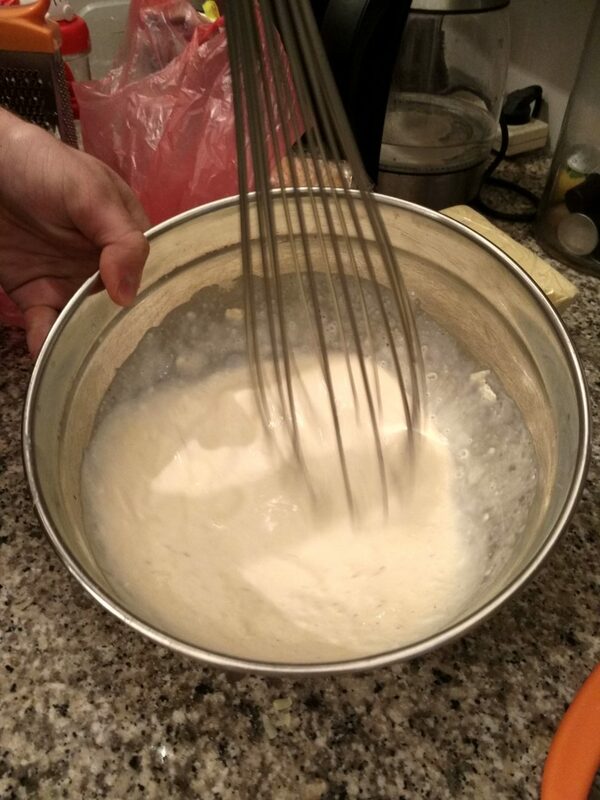 Cool for 30 minutes and serve.